Video game music is the soundtrack or background music accompanying video games or TV games, mainly constituted by game theme songs, game sounds, original soundtrack (OST) and background music. Video game music is indispensible in any games because it can enhance the play experience, that is, the game soundtracks offer certain emotion for whole game and foil atmosphere. And it can also move the game plot along and help player perfectly fitted into the game as well. The interesting thing is that some games are going from zero to hero with the hot video game music/soundtracks. Therefore, there are increasingly number of people are fond of getting video game music download. How to Free Download Video Game Music? Free download any video game soundtracks from YouTube. Download and convert video game music from/for YouTube. For every video/online/app games, the game scene is blood, the game plot is bone while the music is the soul. There are many fabulous and cool video game soundtracks worth a download. So in this part we will show you how to easily download video game music/soundtracks/OST/game theme songs MP3 MP4 for free. Before everything, you are highly recommended to use WinX YouTube downloader, the best free and safe video music downloader. It can easily download any video game music and other videos in 720p 1080p HD or 4K 8K UHD with super fast speed and keep the original quality. Plus, this all-in-one video music downloader supports for downloading from over 300 online video sharing sites like YouTube, Vevo, Vimeo, Dailymotion, Yahoo, etc. 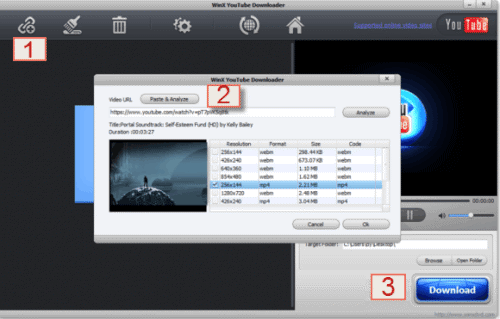 Preparation: Free download WinX YouTube downloader and install it. Step 1: Copy and paste video game music full URL. Find your favorite game soundtrack and copy the entire link (start with https://www....). Click the first button located in the upper bar named "+ URL" and tap "Paste & Analyze" button to finish the first step of video game music download. Step 2: Analyze the video game soundtrack MP3 MP4. After a few seconds, you are able to see the different format, size, resolution and code listed in the box and you can choose one option that fits you most, hit "OK". Note: As shown in the screenshot, WinX YouTube downloader supports for downloading MP3 MP4 and other media files. So you can download any video music by this remarkable downloader for offline listening or watching. Step 3: Run video game music download. You are free to choose a destination folder to save your downloaded video game MP3 MP4 by clicking "Browse" button. All things done, tap "Download" to get your target video game soundtracks download process started. If you are not familiar with any game music but show strong interests towards them, we list the top 5 game music soundtracks of all time for you here. And we hope with the recommendations below, you will find your favorite video game music to download quickly. This music was composed by Argentinean musician Gustavo Santaolalla. The Last of Uswon Excellence in Musical Score at the 2014 SXSW Gaming Awards, and the soundtrack received nominations at the 10th British Academy Video Games Awards and Spike VGX 2013. It's a game about finding strength in friendship. It's a game about holding hands. Although Ico and its video game music didn't won a commercial success, it was critically acclaimed for its art and story elements and received several awards. The original soundtrack has been hailed as one of the best video game soundtracks ever made, and the Original Sound Version album met with similar applause. This album and video game music are really worth downloading. It took three years for Austin Wintory to write and record the soundtrack to the game, mostly in fits of creative bursts and play testing like approached the video game music as "essentially a cello concerto". Portal is a funny game, but it’s also a chilling one – not even in survival horror has a score created such unease so effortlessly. Advanced version WinX HD Video Converter Deluxe - Free download any YouTube video game music in HD MP4 and convert SD/HD videos, make photo slideshow, edit videos and so on.